Facebook has just released the top trends of 2013 in its 2013 Year in Review. It has the top life events (the most shared milestones around the world), top check-ins around the world (the most popular destinations people checked into), the most talked about topics around the world and the most talked about topics near you. 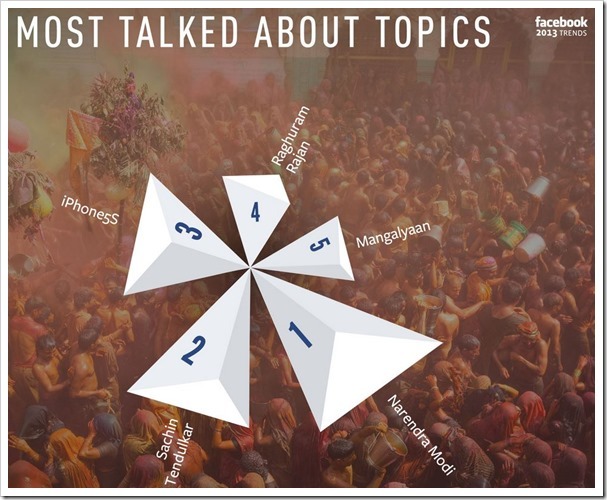 Lets first look at the most talked about topics in India. India is going through a NaMo (read: Narendra Modi) wave, and if you did not feel in the results of the elections just declared, Facebook proved it. With more than six and half million likes on Facebook, he had to be the most talked about topic by a big margin. If politics is numero uno, can cricket be far behind? Just retired Sachin Tendulkar made the second spot and the tech crazy folks ensure iPhone 5S made the third. Dashing RBI governor, who is seen as a messiah to revive the economy was at fourth and the cheapest Mars mission from India, Mangalyaan, fifth. 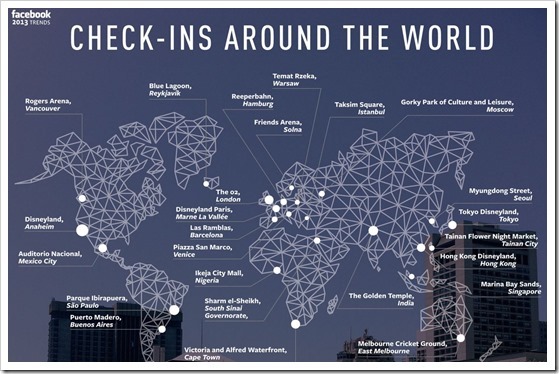 The place where most Indian users checked-in was Sukhdev Dhaba at Murthal, followed by the Golden Temple, Amritsar, Bangla Sahib Gurudwara, New Delhi, Connaught Place, in New Delhi, Prasads IMAX movie theatre in Hyderabad, India Gate in New Delhi, Marine Drive, Mumbai, Taj Mahal in Agra, Starbucks, Connaught Place in New Delhi and PVR, MBD Neopolis, Jalandhar. We are on Facebook to trumpet to the world our personal life, our emotions and moments we want to share on our timeline. Not surprisingly, ‘added a relationship (got engaged/married)’ topped the list, followed by ‘travelled’, ‘moved’ and ‘ended a relationship’. The others in the top ten list include ‘First met a friend’, ‘added a family member’, ‘got a pet’, ‘lost a loved one’, ‘got a piercing’ and ‘quit a habit’. The habit of ‘checking’ into Facebook the first thing when you reach any place has become our second habit now. The Golden Temple in India, Disneyland in California, Paris and Tokyo, Melbourne Cricket Ground at Melbourne are some of the top places where people like you and me have checked in without fail. Pope Francis, the 266th Pope and the current Pope of the Catholic Church who was elected in March topped the list. The word ‘election’ was second, considering elections are in India, Iran, Kenya and Italy and Kate Middleton & Prince William’s Royal Baby third in the list. Calamities like Typhoon and Flood was also a part and so was Harlem Shake and Miley Cyrus. The Boston Marathon, Tour de France and the demise of legend Nelson Mandela made up the other spots. For those interested, Facebook also offers the option for individual users to create their own years in review, which highlight some of your biggest posts from the year. For top life events and check-ins, Facebook looked at which life events and places generated the most posts and check-ins in 2013, and then used the data to create global and country-level rankings. For, most talked about topics, Facebook measured how many Facebook posts in 2013 mentioned a specific topic and then ranked those topics based on the overall number of mentions to create each list. Mentions include both the term itself and related hashtags. For example, both “Here at the #inauguration” and “Proud to be at the presidential inauguration” would be calculated as part of the buzz related to a single event.